The announcement of July 31, 2006, that President Fidel Castro had temporarily transferred his duties to his brother Raúl while recovering from a serious illness2 resulted in increased interest in the long-standing succession versus transition issue. Three days later, the Association for the Study of the Cuban Economy began its sixteenth annual meeting in Miami, Florida, amidst renewed hope for a prompt resolution of Cuba’s future. Many members believed the moment had come to reflect on the contribution ASCE could make to Cuba’s transition to a market economy. Article II of the Association’s bylaws (www.ascecuba.org) states as one of its purposes, “offering recommendations on the social, economic, legal and environmental aspects of a transition to a free market economy and the development of a democratic society in Cuba.” However, one has to admit that, despite sixteen years of (what we would like to call) productive work, very little information existed in a ready-to-use form. 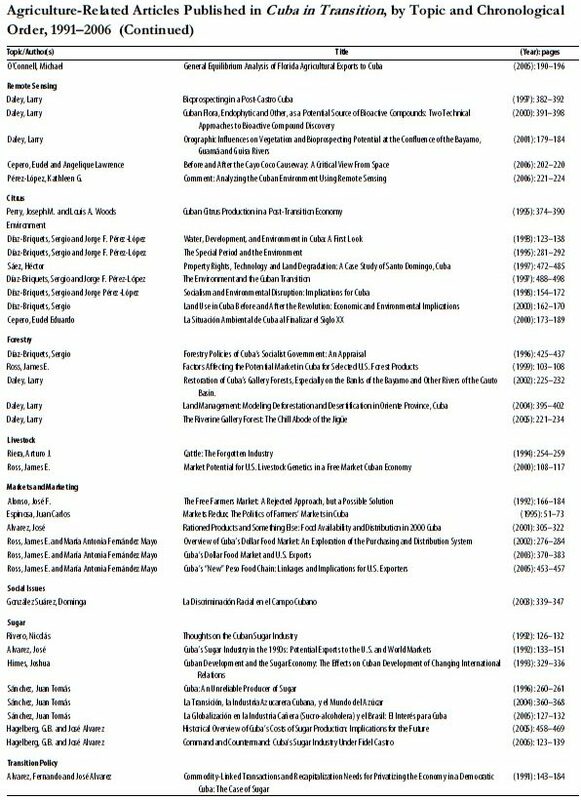 A compilation of a dozen papers (Pujol, 2004) that was distributed to ASCE members and sent to Cuba. Each paper deals with a specific subject. The Saturday morning session of the 2006 meeting was devoted to a panel under the title “Meeting to Define Economic Policy Actions for Submission to the Council of Ministers of Cuba: A Simulation.” A DVD, “An Example of Economic Measures by a Transition Government,” was produced and distributed in Cuba. A few members interested on sector-specific topics exchanged ideas at last year’s meeting on how to assemble a comprehensive summary of the current literature. Some of us felt that change (however defined) in Cuba was going to surprise us and catch us empty-handed. (Such surprise would be ironic after predicting “Next Christmas in Havana!” for almost fifty years.) I myself suggested to ASCE’s President and other members of the Board that the sole theme of the 2007 conference should be the compilation of information by topics, and not individual papers, on what we had done and failed to do in each sector and sub-sector of the Cuban economy. As this year’s program shows, that suggestion was not entirely followed. Another year has passed and we are holding our seventeenth annual meeting in a continued state of suspense regarding developments in Cuba. Less-happy faces than last year’s should serve as an incentive to move forward and produce the documents that we should have assembled in the last 12 months, if not long ago. It also identifies some of the missing issues that need to be studied and incorporated into the current state of knowledge. Since the Association is mostly composed by professionals working in the areas of social sciences (anthropology, economics, finance, political science, sociology, etc), law, banking, and several fields of entrepreneurship, the agricultural professionals are a relatively small group. Despite their small number, the record shows that they have developed a solid base of knowledge that could be used to help in the transformation of Cuba’s agricultural sector. 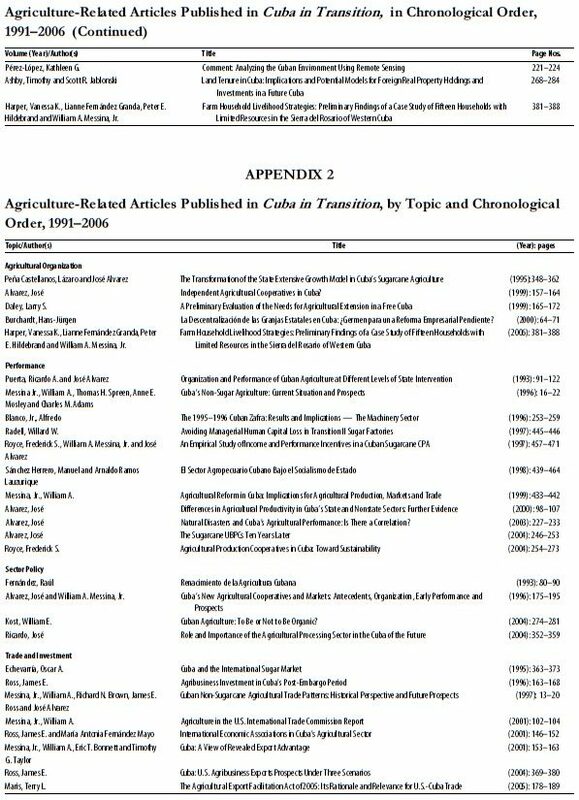 The proceedings of the sixteen annual meetings from 1991 to 2006 contain 77 agriculture-related papers (excluding comments) out of a total of 595 in all fields (Figure 1). The average number was 4.8 per meeting, ranging from one in 1994 to seven in 1996, 2000 and 2004. The relative share of agriculture in the total number of papers in the annual proceedings volume ranged between 3.4% in 1994 to 20.6% in 2004, the annual average being 13.3%. Although not all topics received the desirable level of rigorous treatment, I believe that the papers contain sufficient material to elaborate a report with recommendations. From a casual look at the list it is obvious that there are important gaps that should have received attention. Some major issues to be addressed are outlined below. A Spanish scientist is the latest to speak of a fundamental myth that arose in the middle of the 19th century and still persists today. According to Fernández Prieto (2005, p. 19), this is the belief in “the kindness of the climate and the extreme fertility of Cuban lands; it states that it is just enough to place a seed on the ground to obtain quality crops.” Many Cubans hold this belief without any scientific basis.4 It is one of the reasons for some of the failures of Cuba’s socialist agriculture in that it underpinned unrealistic plans on the assumption of ideal year-round weather and inexhaustible soil fertility, true in some but not in all regions of Cuba, and ignoring the problems of soil maintenance in the tropics (Hagelberg and Alvarez, 2006, p.129). The falsity of this myth cannot be demonstrated too often. 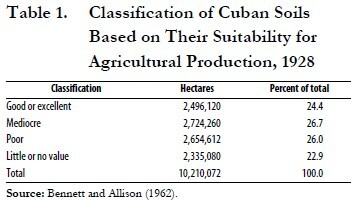 Despite the importance of agriculture in the Cuban economy since Colonial times, it was not until 1928 that a thorough survey of the characteristics of the island’s soils was published (Bennett and Allison, 1962). This book has been the foundation for all subsequent studies. From the 16 families and 111 series of soils described by Bennett and Allison, four major categories have been identified according to their quality, use limitation, and agricultural potential (Table 1). Out of the island’s total area of some 10 million hectares (ha), 50% consists of coastal marshes, mangroves, mountainous and rocky areas, and plains with limited or no agricultural value (Aranda, 1975, p. 221). Only half of the remaining 50% was considered good or excellent at the time the study was conducted. This poses the question: How many more hectares from Cuba’s stock of cultivable soils would have to be eliminated now because of environmental damage from agricultural practices? Bennett and Allison discussed the main causes for land degradation: erosion, compaction, salinization, drainage and acidification. The growth model adopted by the postrevolutionary state, in general, and the indiscriminate application of chemicals, in particular, have greatly worsened that situation. It is imperative to conduct a new soil survey in order to define the areas suitable for crop and/or livestock production and those where the damage could be remedied. This task could be performed by an interdisciplinary team. 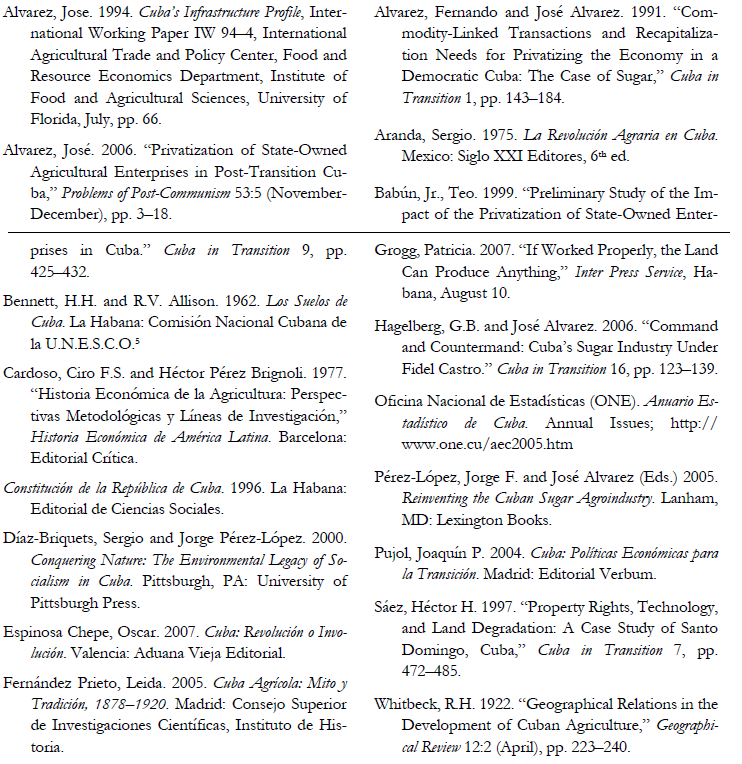 Some information is available in Cuban journals. Recently, an Inter Press Service’s correspondent in Havana wrote that “the degradation of soil is one of the environmental challenges faced by Cuba in terms of making agriculture sustainable” (Grogg, 2007). Based on official statistics and statements by an agronomist, she depicted the current situation. There are 6.6 million ha of arable land, but 75% is affected by one or more of the following problems: low fertility, 3.0 million ha; extremely low content of organic matter, 4.6 million ha; salinity, 1.0 million ha; and medium to severe erosion, 2.5 million ha. The problem is that we do not know the location of those soils. The problem of updating the soils inventory has a solution, but it would cost a large sum of money. Here is a challenge for an interdisciplinary team: develop a proposal to obtain grant money and, with the use of remote sensing technology, map the current status of Cuban soils. The images have been collected since 1971 by Landsat satellites and stored by the U.S. Geological Survey. They need to be purchased and classified before they can be used. This project would provide valuable information to scientists studying different sectors of the Cuban economy, especially those issues related to the environment. Although intended as an inventory for analysis of privatization, Babún (1999) presents information on important aspects of Cuba’s infrastructure. The profile by Alvarez (1994) is outdated, although it provides some useful information. Cuba-Caribbean Development, a division of Babún Group Consulting, Inc., is perhaps the best source of information developed for sale to companies interested in trading and/ or investing in a future Cuba (see http://www.cubadata. com). Their reports cover from infrastructure to individual commodity profiles. Some of them however, have information only until 1989. With respect to land, chapter X of the Anuario Estadístico de Cuba is a good source of general information. It has data on agricultural and non-agricultural lands by type of land tenure, crops, yields by sector, and other matters. 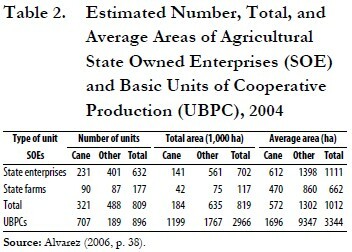 Concerning agricultural units, Alvarez (2006) compiled the available statistics for state-owned enterprises (Table 2). The number of units outside the state sector has varied tremendously over the years and it is difficult to come up with a reliable figure. This topic has attracted special attention by ASCE members. A considerable number of papers have been presented, but they are mainly based on the experiences of former socialist countries and relate to the economy in general. Despite the recent effort by Alvarez (2006), a comprehensive blueprint for the privatization of Cuba’s agricultural sector is still urgently needed. The information on production and processing plants has always been scattered and not totally reliable. The situation worsened during the Special Period and the advent of foreign investment on the island. Today, it is almost impossible to develop a list of plants in the agricultural and agribusiness sectors, and one is needed. The amount of data accumulated on the sugar industry is only matched by the degree of our ignorance concerning the real status of the industry. From current statistics one can conclude that the industry is about to fulfill Castro’s requiescat. Recent efforts at partially resurrecting sugar have failed. 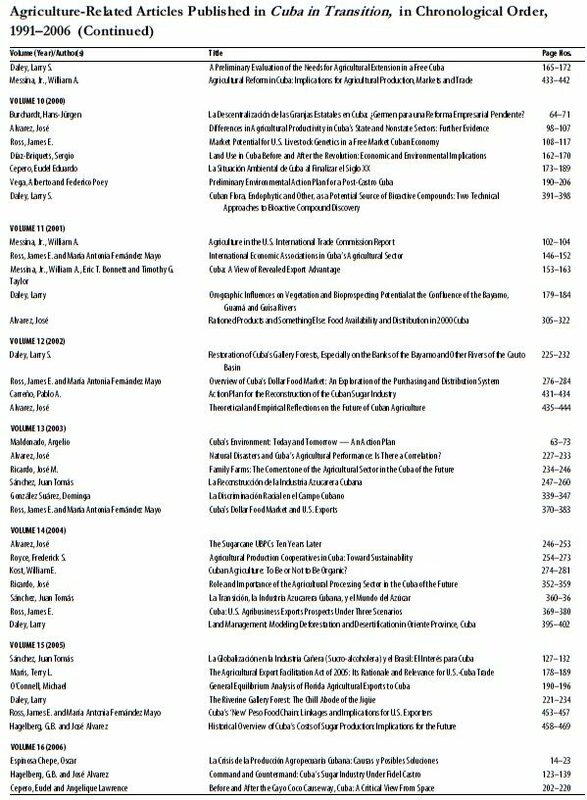 A few years ago, several ASCE members joined international experts in a volume on the sugar sector (Pérez-López and Alvarez, 2005) which made a series of recommendations based on sugarcane as an energy crop and the production of different output combinations (sugar-energy-specialty products) according to market requirements. Evidently inspired by Brazil’s success and world oil prices, some Cuban exiles who were sugarcane growers or processors before the revolution are promoting the idea of devoting all sugarcane lands to ethanol production in Cuba. Although ethanol could well become an important part of the product mix of the industry, a total shift to this commodity appears unrealistic. Aside from the many political and other considerations that speak against this proposal, the lack of knowledge about the real status of the industry and the condition of its lands would require a thorough feasibility study in Cuba itself to establish the extent of a possible diversion of sugarcane to ethanol. Future investors are likely to demand more knowledge about potential areas than there is today. Even now, this presents an opportunity for consulting firms or individual experts. Market profiles for a particular commodity or group of commodities are needed. Collaborative work between the University of Florida’s Institute of Food and Agricultural Sciences, especially its Food and Resource Economics Department, and the University of Havana led to a series of reports that could be updated relatively easily. The website http://www.cubanag.ifas.ufl.edu contains commodity reports, other publications, general information and a series of useful links. Additional information about Cuba can be found at the website of the Florida Cooperative Extension Service at http://edis.ifas.ufl.edu searching in the Food and Resource Economics Department. Exporting agricultural products from Cuba to the United States will not be an easy process. It will be cumbersome undertaken involving field trials in Cuba and extensive inspections and sanitary evaluations. Lifting the embargo will be a necessary but not a sufficient condition for agricultural exports to start flowing from Cuba to the United States. For those disciplines lacking enough papers in the ASCE proceedings for immediate compilation, it is not too late to start new lines of research, establish contacts on the island, and work together. Despite our long wait, change is unlikely to come as quickly as we thought last year, and nobody can predict its path. I challenge the specialists in other fields to develop similar inventories and an agenda to work in teams, and to those working on agriculture to expand this work. Data can be found in many places already familiar to most of us. However, the most important source of information is on the island, from people working inside and outside the government. There are those who would have nothing to do with anybody in Cuba who do not fully share their political views. 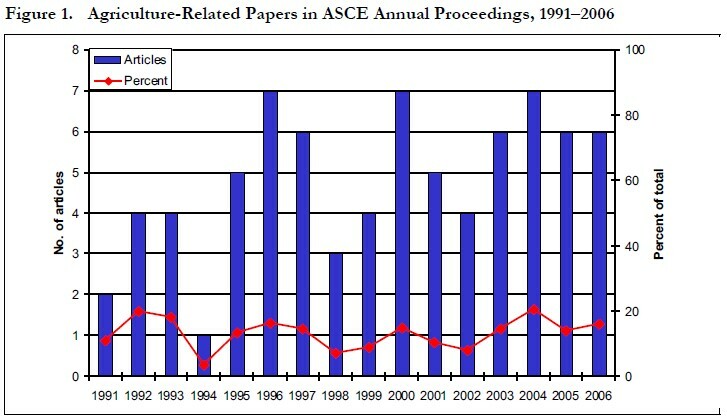 Efforts to develop and maintain contact with government economists during ASCE’s early years showed intolerance on both sides. For obvious reasons, ASCE strengthened its ties with the dissident economists on the island. It has been a productive relationship. But, “official economists” — so called to distinguish them from the “dissident economists”—have also produced very useful publications. I believe the official and the dissident tend to complement each other. Dissidents have limited freedom to write and speak, and no access to the public and restricted access to statistics. The reverse is true for official economists, and some of them have shown their bravery in numerous occasions. The bottom line is that they are in Cuba and we are not. This applies to all disciplines. It is time to join forces and work together. It is not the time for a self-appointed “petit comité.” Just as no one can claim the monopoly of truth or love for Cuba, nobody can claim the monopoly of knowledge about Cuba’s transition. Long was the journey, and bitter the road. Although both authors agree with the French philosopher Bastiat (1850) that laws should minimize the ability of politicians to grant favors, they disagree on other future roles of the Cuban State. One of the authors believes with Thomas Jefferson that “government governs best that governs least,” the other sees a larger role for the State. Yet, by sharing the same goals, they were able to find a solution to accommodate both preferences. We hope that this experience will be shared by Cubans engaged in the problems of transition to a free and democratic Cuba. Then, and only then, the “here is sugar without tears; to say, I have returned, do not fear” will become truly relevant (1991, p. 176). —Fue largo el viaje y áspero el camino. Creció un árbol con sangre de mi herida. Canta desde él un pájaro a la vida. La mañana se anuncia con un trino. 1. The author thanks Jerry Hagelberg for this comments and thorough editing of an earlier draft. The usual caveats apply. 2. The transfer of presidential duties is in accord with Article 94 of the Cuban Constitution, which states: “In cases of the absence, illness or death of the President of the Council of State, the first vice president assumes the president’s duties” (Constitución, 1996, p. 47). 3. 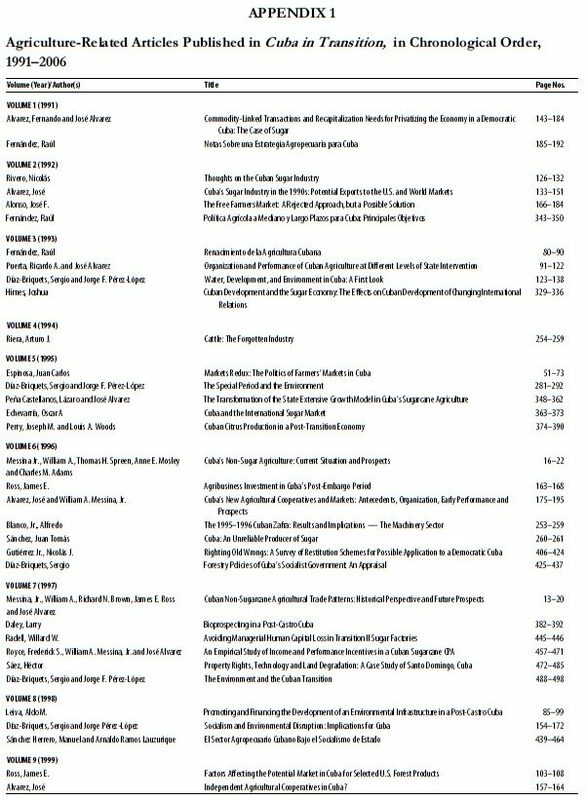 The agricultural scientists have covered a wide range of sub-disciplines, including agronomy, economics, the environment, finance, law, marketing, natural resources, processing, trade and investment, among others. 4. See, for example, Whitbeck (1922, pp. 225–226; 228–230). The prodigal virtue of tropical agriculture was criticized by Cardoso and Pérez Brignoli in the 1970s when stating that it was a terrible mistake to believe in the presence of a static nature (“without histories”) in tropical agriculture (1977, p. 22). 5. This is a translation of the original book published in English in 1928 as The Soils of Cuba.